But when a bulb burns out, it’s practically useless… well, almost. Time to dispose of the bulb and never to think of it again, right? Not so fast! That burned-out bulb—heck, even a brand spankin’ new one—can easily be repurposed for a project that will brighten anyone’s home. Grab your pliers and don your protective gloves: science class is now in session! Today, we’re modifying a light bulb to be more than just a great idea. You’re turning it into an entire tiny terrarium! To Make Your DIY Lightbulb Terrarium, It’s Important To Protect Your Hands. All You’ll Need For That Is A Pair Of Gloves. After That, Grab Your Pliers. The First Step You’ll Want To Take For This Project Is To Remove The Silver Knob-looking Thing In The Bottom Of The Bulb. After The Knob Is Removed, You’ll Have Easy Access To The Black Base Of The Bulb. Again, Using The Pliers, Remove That Base. It Might Come Off In Pieces, And That’s All Right. Just Make Sure It’s Totally Removed! Next, Grab An Attractive-looking Stone With A Flat Side. Dab A Few Spots Of Hot Glue On The Flat Surface. This Is The Base That Will Eventually Keep Your Fragile Lightbulb From Rolling Away. Go Ahead And Affix The Light Bulb To The Part Of The Stone Where You Placed The Glue. The Light Bulb Can Sit On The Stone Whatever Way You Think Looks Best; Just Make Sure You Have Easy Access To The Opening In The Bulb’s Base. Next, Grab A Piece Of Paper And Roll It Up Into A Cone. This Is Going To Act Like A Makeshift Funnel, Which You’ll Need To Insert Into The Base Of The Bulb. Now You’re Ready For The Party To Really Get Started! Slip Some Gravel Into The Funnel So That It Rests At The Bottom Of The Bulb. This Is Crucial For Draining Excess Water Later On. After That, Cover The Gravel With A Few Pinches Of Sand. Lastly, Cover The Sand With A Smattering Of Dirt. Use A Pair Of Tweezers And Some Surgical Precision (or At Least The Precision You Developed From Playing Operation back In The Day), You Can Now Insert A Plant Of Your Choosing Into The Dirt Of Your Light Bulb Terrarium! You’re Almost There! 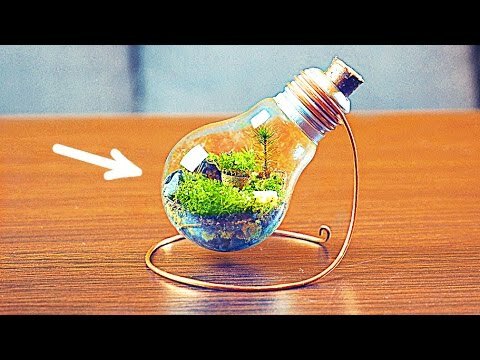 The Tiny Terrarium You’ve Created Inside The Lightbulb Needs Just One More Thing: A Few Drops Of Water. You Can Use A Syringe For That Or Even A Straw. Be Careful Not To Flood Your Mini-habitat! After This, There’s No Turning Back! The Final Step Is To Seal Up Your Light Bulb. You Can Place Some Hot Glue To The Cap Of An Acorn Or A Rock And Attach It Over The Opened Base. The Base Needs To Be Closed Tight, Though, In Order For The Terrarium To Flourish. Once Your Terrarium Is All Sealed Up, It’s Ready To Be Displayed! Consider Making Terrariums Using Different Vegetation And Colors For Each Season Of The Year. Really, The Only Limit To This Idea Is Your Own Imagination! If You Want To See The Video Play-by-play Of The Light Bulb Terrarium Project, You’re In Luck! You Can Find The Perfect Explainer Video Below. Even If You Don’t Speak Russian Like The Narrator In The Video, It’s Easy To Follow Along With The Steps!